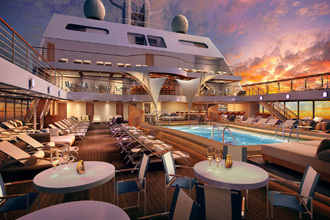 Step aboard Seabourn's ultra-luxury 600-guest Seabourn Encore and you will experience the finest luxury vacation. Along with her twin sister, Seabourn Ovation (arriving in 2018), the 40,350-ton ship is the largest in the line's modern fleet. The all-suite, all-veranda ship has been delighting discerning travelers since her debut in December 2016. She has an additional deck for a total of 12, plus more public areas than her Odyssey-class predecessors. Master designer Adam D. Tihany created stunning contemporary spaces, including the gorgeous main dining room and other areas. 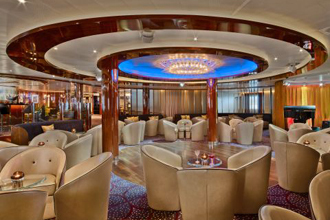 His work reflects Seabourn's emphasis on beauty and understated elegance so seasoned cruisers who expect the very finest will be comfortable and feel right at home. 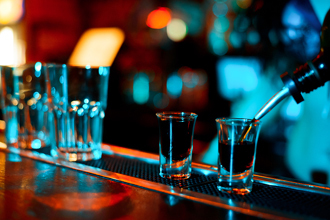 They will also enjoy a high level of personalized service, with nearly one staff member for each guest. 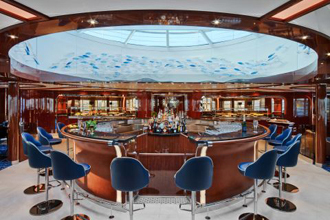 A beautiful observation bar was introduced on Seabourn Encore. 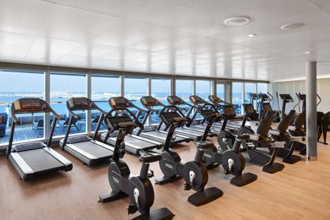 Surrounded by floor-to-ceiling glass walls, it is the ship's highest indoor viewing point, boasting 270-degree forward-facing views. Adding to its lovely ambiance is a semi-circular skylight casting sun rays and moonlight over the entire area. Comfortable lounge chairs and high-backed barstools surrounding the square bar and provide a perfect place to have a drink and enjoy conversation as you enjoy white-glove tea service and cocktails, canapés and piano entertainment in the evenings. Meet with friends for pre-dinner drinks at the popular club, a lounge with easy access to an exclusive intimate al fresco lounge area, conveniently located near the plunge pool and two whirlpool spas. 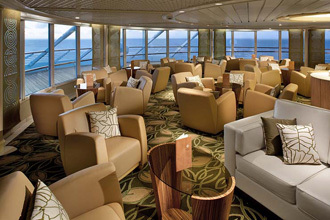 Feel like you are in your own living room at the ship's social hub, with welcoming sofas and chairs, as well as a computer center and an enclave with concierge service. Fresh pastries, gelato, sandwiches and your favorite brew are offered at the European Konditorei-style coffee bar. When you are in the mood to shop, choose from a myriad of luxury watches, jewelry and perfumes at the boutiques. 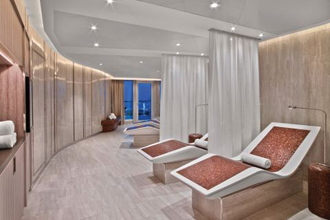 Also featured on Seabourn Encore is a fabulous spa in a spectacular setting. Choose from a variety of relaxing treatments that will make you feel like new. 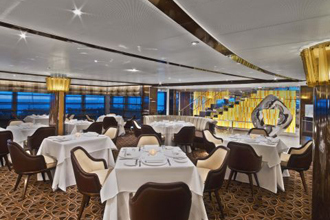 Seabourn's renowned dining includes its signature grill restaurant by world-famous chef and restaurateur Thomas Keller, named by Time magazine as "America's Best Chef." 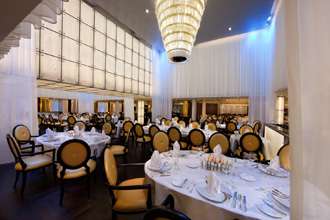 The main restaurant, complete with a wine tower, is the dining venue for breakfast, lunch and dinner for a variety of delicious international dishes. Casual eateries include à la carte selections and a buffet. An incredible restaurant serving mouthwatering sushi is sure to please your palate. Luxurious suites all boast a private veranda. Make yourself at home in these stunning accommodations with high-end finishes and rich mahogany wood, with nautical influences as one might find on a yacht. In-suite amenities include a living area; queen-size bed or two twin beds and a separate living area with expansive ocean views. Additionally, there is a walk-in closet with a personal safe, a pillow selection, plus a complimentary mini-bar that is re- stocked and refilled daily with your favorite wine and spirits. Elegant and modern all-marble bathrooms with stunning polished stone, a full tub, shower, double sinks and high-end toiletries are also featured. Pampering at the highest level includes the service of a Personal Suite Stewardess for guests in the Penthouse Suite. From drawing your bath to welcoming you with champagne and canapés to nightly turndown service, plus handling any special requests, you will be treated like royalty. Evening entertainment includes performances at the beautiful show lounge, with plush chairs arranged for cabaret-style seating. Enjoy musical shows, classical musicians, comedians, dancing and more. The well-appointed casino lets you indulge in your favorite games. Exuding luxury, if you are a discerning cruiser who desires the very finest of everything, the Seabourn Encore is waiting for you. 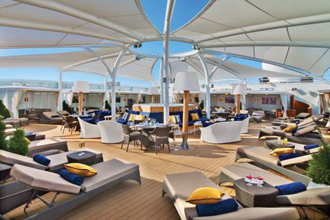 Cruise on the Seabourn Encore to worldwide destinations. 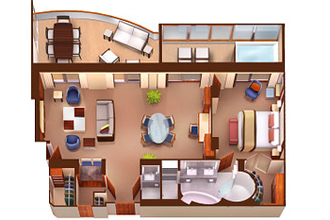 Inside space of 1,292 sq.ft. plus two verandas totaling 244 sq.ft.Large windows, dining for six, glass-enclosed solarium with tub and day bed, two bedrooms, two bathrooms (one whirlpool), guest bath, convertible sofa bed for one, pantry with wet bar, three closets and three flat-screen TVs. Complimentary internet/Wi-Fi service. Suites aboard Seabourn Encore feature a comfortable living area, private veranda, queen-size bed or two twin beds, walk-in closet with personal safe, interactive flat-screen TV with music and movies, fully-stocked bar and refrigerator, writing desk with personalized stationery, makeup vanity, spacious bathroom with separate tub and shower, plush robes, slippers, hair dryer and 110/220V AC outlets. Owner's Suites feature expansive ocean views, forward-facing windows, dining for four to six, bathroom with whirlpool bathtub, guest bath, pantry with wet bar, and two flat-screen TVs. Convertible sofa for one, Complimentary Internet/Wi-Fi service.Located on Deck 7, 8, 9 and 10; total inside space of between 576 and 597 square feet (54 and 55 square meters) plus veranda of between 142 and 778 square feet (13 and 72 square meters). 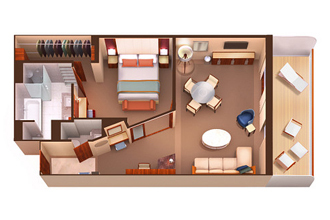 *Wheelchair accessible suites are roll-in shower only. 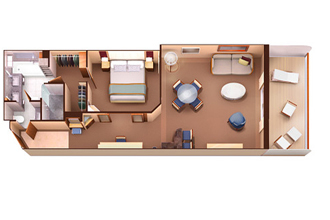 All Penthouse Suites feature dining table for two to four and separate bedroom. Glass door to veranda, two flat-screen TVs, fully stocked bar, spacious bathroom with tub, shower and large vanity.Located on Deck 10 and 11; total inside space of between 449 and 450 square feet (42 square meters) plus one veranda of between 93 and 103 square feet (9 and 10 square meters). All Penthouse Spa Suites feature dining table for two to four and separate bedroom. Glass door to veranda, two flat-screen TVs, fully stocked bar, spacious bathroom with tub, shower and large vanity.Located on Deck 11; total inside space of between 639 and 677 square feet (59 and 63 square meters) plus veranda of between 254 and 288 square feet (24 and 27 square meters). This category can be booked for a special rate, guaranteed to you. Please note that the category is not associated at the time of booking with a specific stateroom, deck, bedding configuration or other particular settings. The assignment of an actual cabin will be performed during your check-in. 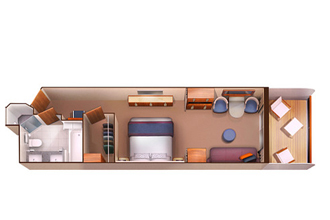 The cabin can be anywhere on the ship.This category can be booked for a special rate, guaranteed to you. Please note that the category is not associated at the time of booking with a specific stateroom, deck, bedding configuration or other particular settings. The assignment of an actual cabin will be performed during your check-in. The cabin can be anywhere on the ship.This category can be booked for a special rate, guaranteed to you. Please note that the category is not associated at the time of booking with a specific stateroom, deck, bedding configuration or other particular settings. The assignment of an actual cabin will be performed during your check-in. The cabin can be anywhere on the ship. Signature Suites feature expansive ocean views, forward-facing windows, dining for four to six, bathroom with whirlpool bathtub, guest bath, pantry with wet bar, and two flat-screen TVs. Complimentary Internet/Wi-Fi service.Located on Deck 8; forward suites 800 and 801 inside space of approximately 977 square feet of inside space (90 square meters), plus one veranda of 960 square feet (89 square meters). All Veranda Suites feature a full-length window and glass door to private veranda, comfortable living area, queen-size bed or two twin beds, dining table for two, walk-in closet, interactive flat-screen television with music and movies, fully stocked bar and refrigerator, makeup vanity, spacious bathroom with shower.Located on Decks 7 and 9; total inside space of between 246 and 302 square feet (23 and 28 square meters) plus one veranda of between 68 and 83 square feet (6 and 7 square meters). All Veranda Suites feature a full-length window and glass door to private veranda, comfortable living area, queen-size bed or two twin beds, dining table for two, walk-in closet, interactive flat-screen television with music and movies, fully stocked bar and refrigerator, makeup vanity, spacious bathroom with separate tub and shower.Total inside space of between 246 and 302 square feet (23 and 28 square meters) plus one veranda of between 68 and 83 square feet (6 and 7 square meters). *The veranda railings on Deck 5 are part metal and part glass from floor to teak rail. Suites on Deck 5 have slightly larger verandas. Wheelchair accessible suites are roll-in shower only. All Veranda Suites feature a full-length window and glass door to private veranda, comfortable living area, queen-size bed or two twin beds, dining table for two, walk-in closet, interactive flat-screen television with music and movies, fully stocked bar and refrigerator, makeup vanity, spacious bathroom with separate tub and shower.Located on Decks 6, 7 and 11; total inside space of between 246 and 302 square feet (23 and 28 square meters) plus one veranda of between 68 and 83 square feet (6 and 7 square meters). 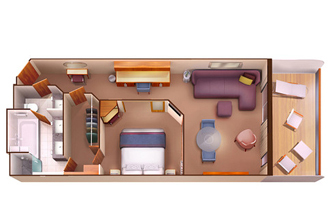 *Wheelchair accessible suites are roll-in shower only. All Veranda Suites feature a full-length window and glass door to private veranda, comfortable living area, queen-size bed or two twin beds, dining table for two, walk-in closet, interactive flat-screen television with music and movies, fully stocked bar and refrigerator, makeup vanity, spacious bathroom with separate tub and shower.Located on Decks 8 and 9; total inside space of between 246 and 302 square feet (23 and 28 square meters) plus one veranda of between 68 and 83 square feet (6 and 7 square meters). All Veranda Suites feature a full-length window and glass door to private veranda, comfortable living area, queen-size bed or two twin beds, dining table for two, walk-in closet, interactive flat-screen television with music and movies, fully stocked bar and refrigerator, makeup vanity, spacious bathroom with separate tub and shower.Located on Decks 6 and 7; total inside space of between 246 and 302 square feet (23 and 28 square meters) plus one veranda of between 68 and 83 square feet (6 and 7 square meters). 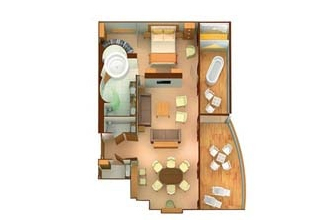 *Wheelchair accessible suites are roll-in shower only. All Veranda Suites feature a full-length window and glass door to private veranda, comfortable living area, queen-size bed or two twin beds, dining table for two, walk-in closet, interactive flat-screen television with music and movies, fully stocked bar and refrigerator, makeup vanity, spacious bathroom with separate tub and shower.Located on Decks 8, 9, 10 and 11; total inside space of between 246 and 302 square feet (23 and 28 square meters) plus one veranda of between 68 and 83 square feet (6 and 7 square meters). 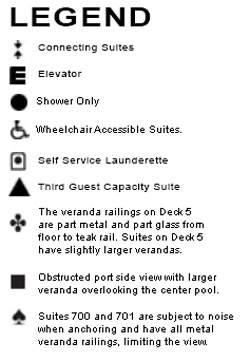 *Wheelchair accessible suites are roll-in shower only. Skilled chefs create exquisite sushi before your eyes for a delightfully visual, authentic lunch or dinner experience.The open concept sushi bar is located in the center of the room, with bar seating around it. Two-seater tables and chairs are placed along the walls of the room and in front of the ocean facing windows. 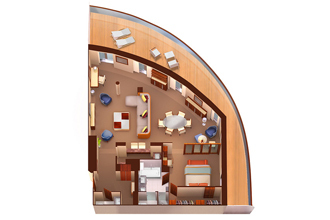 Additional tables that seat four are found in the center of the room, with a semi-private area in the back-right corner of the room. 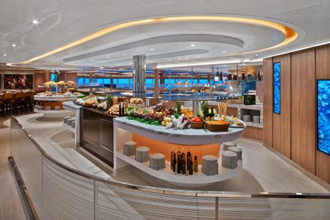 The Grill is a unique culinary concept exclusive to Seabourn. Guests setting foot inside the elegant dining room will be treated to table-side preparations of Caesar salad and ice cream sundaes as well as a range of other steakhouse favorites like Lobster Thermidor and creamed spinach, presented a la carte. The timeless menu will draw on the freshest products from artisan purveyors. A cocktail program and wine list of domestic and old-world labels complement the menu. 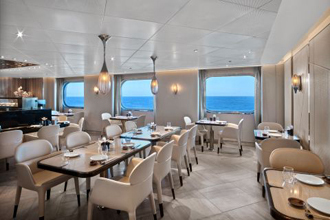 The Restaurant is Seabourn's primary dining venue, serving a fabulous combination of innovative fare and classic favorites for lunch, and dinner. An open seating policy allows passengers to choose their dining companions and enjoy their meals at the time that is best for them. 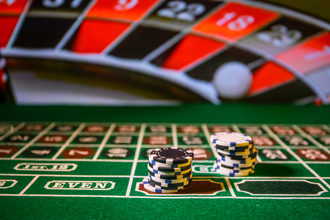 The Casino's atmosphere brims with excitement, offering guests the opportunity to try their hand at a selection of popular table games, in addition to an extensive array of slot machines.The Casino offers a range of table games, including roulette, which located in the center of the room. Slot machines are found along the walls of Casino. A unique facility that is open for afternoon tea and transforms into a hot dance club in the evening, The Club features a cosmopolitan main room and a terrace with a plunge pool and two whirlpool spas. Socialize day and night while enjoying sophisticated cocktails, live music, and great company.There is a bar located to the right of The Club with bar stools surrounding it. There is a wide range of seating throughout the room, with a low glass partition separating the bar area from the dance floor and additional seating. 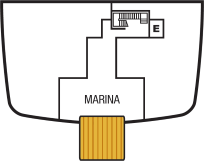 The dance floor is located in the center of the room and towards the ocean facing windows. Surrounding the round dance floor, you will find the additional seating, which is a mix of arm chairs and booths. Hosting a variety of daytime and evening events including lectures, movies, cooking demonstrations, cabaret performances, stand-up comedy, live music, and much more, the Grand Salon offers something to keep people of all tastes entertained throughout the day.At the front of the room of the Grand Salon, you will find a stage at the base of the large theater. The seating starts at the stage level, with rows of seating leading up to the back of the room. There are rows of arm chairs and sofa style throughout the theater.